It’s not that the F-35 doesn’t warrant some criticism—the list of problems is long and has been documented in both my own writings for ASPI and numerous US government reports, among others. Even the most ardent of F-35 supporters can’t argue with the uncomfortable fact that the RAAF is still six years away from getting an aircraft they were supposed to already be flying. I argued two years ago that we need to be thinking hard about Plan B  and I haven’t changed my mind about that. Timelines and engineering margins are uncomfortably tight and the cost growth is uncontestable . The recent leaking of the latest Operational Test and Evaluation (OT&E) report into the open press only added to the public knowledge of the problems. These include the relaxing of some performance criteria  and the revelation that the aircraft in its current configuration can’t fly in lightning . These observations aren’t good news. At this stage of development (and production), there’s apparent ‘zero sum’ engineering going on. The lightning hazard seems to be the result of weight reduction measures required to make some other changes—means that the program could be in real trouble if any significant issues turn up in the extensive testing still to come. These are all reasonable criticisms, and Four Corners made much of them. Much less prominent was any discussion of positive metrics such as recent progress in the flight test program . Also curiously underplayed was the enthusiasm shown by those closest to the aircraft and the staunch support it has within the high ranks of the US Air Force . Of course, they don’t have too much choice , but that those with the most detailed knowledge of the aircraft’s capabilities are solid behind it is surely worth a mention. But my biggest problem with the program is the uncritical way it looked at some unofficial modelling work done here in Australia, the results of which indicate a very poor performance of the F-35 against existing and future threats. If true, the results are very significant indeed. But extraordinary claims require extraordinary evidence  and the Four Corners audience simply wasn’t given enough information to decide—or even enough to realise that it is a hotly contested view. 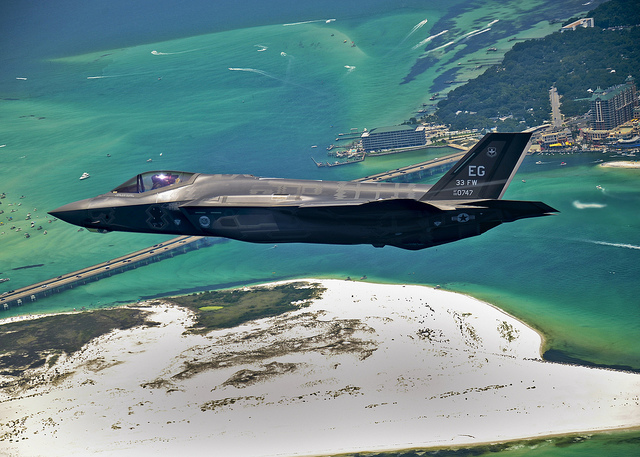 Simulations performed by the USAF and within the F-35 program give very different results. And we’re not just talking a few percent; we’re talking diametrically different outcomes, with the F-35 coming out as far ahead of the opposition as it is behind in the simulations screened last night. These competing studies can’t both be right and the resolution presumably lies in the different assumptions and performance parameters of the aircraft in the competing models—but there was no such discussion to be seen. The simplest of questions would have gone a long way to revealing that there’s actually a significant disagreement here: ‘how does your analysis compare to other work, and how do you account for any differences’? In this context, it’s noteworthy that USAF modellers undoubtedly have access to classified information about the JSF and its prospective adversaries that’s simply unavailable in the public domain. I’m by no means a ‘die in the ditch’ F-35 supporter. In fact, I’ve argued on this blog  that it’s hard to see where a threat that the Super Hornet (our natural fallback option and an aircraft we already fly) won’t be able to deal with would come from for at least the next decade. The acquisition costs and timetable of that option  make it a credible strategy if the F-35 is judged too high a risk. But I think it’s a reasonable proposition that the taxpayers who are asked to pay for either alternative have as much information as possible to make an informed assessment of their government’s decision. That opportunity was missed by Four Corners. Disclaimer: both Lockheed Martin, the prime contractor on the F-35 program and Boeing, manufacturer of the Super Hornet, are corporate sponsors of ASPI. Andrew Davies is a senior analyst for defence capability at ASPI and executive editor of The Strategist. Image courtesy of Flickr user Official US Air Force .